Stripes upon stripes for a day of window shopping and playing tourist around San Francisco. After living here for over two years, I still enjoy getting lost in this city -- just doesn't get old! great outfit Krystal! Stripes on stripes is the best! beautiful!!! you sandals are adorable!!! Very simple and beautiful outfit! I like your dress and necklace very much! The whole outifit is wonderful!Bravo!I like it very much!! !I will try it!!! This is sooo cute, Krystal! Totally pinning this! Absolutely love everything about this outfit. Totally looks like a dress! Love how you've accessorized the skirt and top! Love the print on those maje pieces. Love the dress - what a great look. Love the way you put the same print together !! good job ! You look very beach-ready in this! LOVE this casual chic outfit! SO cute! The necklace seriously screams summer. Super cute outfit. This looks like such a comfortable outfit, great colors! I love this so much! It looks like a dress, which I love. And I love the peach doors in the back ground and your LE jewelry. Perfect! Definitely love the sandals pairing with that dress! Stunning! Love the stripes and the fedora is tres chic!! Absolutely perfect summer look! The stripes are soooo cool! Totally thought this was a dress! I love that you can pull off wearing matching top & bottoms so often - I tried it once in an H&M changing room (in a floral print blouse & shorts) and looked like a crazy old lady ready to tackle her garden. Sigh. LOVE this outfit, definitely my kind of summer look. Love the bag and sandals. Where were these pictures taken, the backdrop is gorgeous! 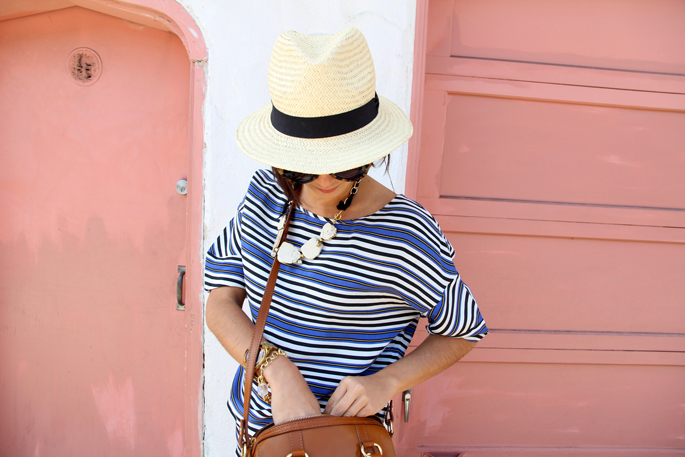 LOVE the stripes and fedora, such a great look for summer! Great idea! I thought you were wearing a dress at first. Love the combination. I would not think it's in SF, but somewhere in South America. Loving the hat and the dress! I want this entire outfit from top to bottom. You look absolutely great! I love how you styled this dress! Very casual. Love it. THIS is an ABSOLUTELY gorgeous look! Love it! Love the ease of this outfit! A great one for flea market shoping! Good Look. I adore your stripes! Can't wait for my trip to SF in October! WOW Love that outfit! Amaizing! I really want a hat so bad for the summer and I think it's your fault. Thanks. i love this outfit! perfect for a day of city wandering! Totally thought this was a dress. So lovely. I'm visiting San Francisco this summer. Can't wait! That's some bold pattern! You look gorgeous! such a cute look for a day of exploring! i've been loving maje lately too...hope they open a SF store! great outfit!! love the hat and dress! Love the stripes, perfect for summer! Wow, love this look! Just gorgeous!!! I'm loving this look!! Maje makes some amazing clothes.